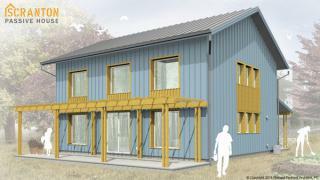 A new 2 story single family residence designed to meet the Passive House standard in Scranton, PA. Located in downtown Scranton on a sloping vacant lot in the hill section, the house is oriented due south for solar optimization. The foundation is a concrete slab over 8” of Pennsylvania perlite over 12” of EPS insulation with r value of R-76. The walls are advanced frame structural 2x4 interior service cavity with 11 7/8” TJI outrigger dense packed with cellulose to 4PSF for an r value of R-62. The roof is a 30” raised heel truss 24” OC with 24” of loose fill cellulose with an r value of R-86. The windows and exterior doors are Intus UPVC. The ventilation is an UltimateAir 200DX with a 9000 BTU Mitsubishi ductless minisplit providing point source heating and cooling. Air infiltration is currently 0.38ACH@50Pa. The project began construction in May 2014. Completion is projected in January 2015. Contractor: Ciervo and Sons Renovatinos Inc.